We’re well into the spring season and may already be looking forward to summer. While there are plenty of things to love about spring, there’s one thing that can feel like a downer: spring cleaning. If the idea of spring cleaning put a chill down your spine, you’re not alone. It’s easy to feel overwhelmed with the thoughts of spending your weekend clearing out the clutter. And it’s even easier to put it off for something (or anything) more fun. Thankfully, it this annual “Out with the Old, In with the New” sweep doesn’t have to be a drudgery. But if you need a gentle push to get started, use these tips to mentally prepare for your spring cleaning tasks and to stay motivated. Guess what: there’s no rule that says you have to commit to a spring cleaning marathon. After all, spring lasts for several months. Instead, stretch your cleaning projects over time to keep each session manageable and allocate a feasible amount of time for each project. Once you’ve cleaned the desired amount of time, you’re done! Making a plan is the best way to ensure success. There’s nothing more daunting (or demotivating) than staring at mountain of chores. 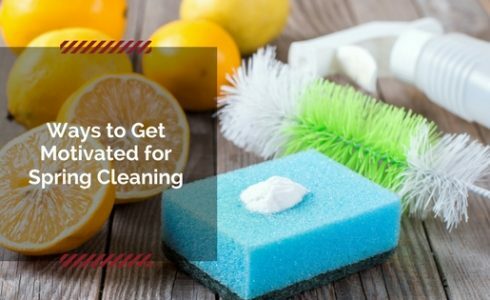 You don’t have to clean absolutely everything in your home. Go through your home and identify the areas that could use some extra love this season and set your priority list. While you’re creating your plan, don’t try to attach the larger, spring cleaning type jobs with your regular cleaning tasks. This will allow you to focus on the larger, less frequent tasks instead of spending the day dusting and vacuuming. You’re usually more beholden to a task when you put it on the calendar, so schedule your cleaning sessions on the family calendar so everyone knows what’s happening and when. Cleaning shouldn’t fall on the shoulders of a single person. Everyone who lives in the house should be able to pitch in with spring cleaning chores. Delegate specific tasks based on who best tolerates them and include children in the cleaning sessions if they’re old enough. If you have a friend or another family member who enjoys cleaning and organizing, consider asking them for help as well. Load up your favorite, high-energy tunes to power you through your cleaning sessions. Music is a great motivator and can keep you moving. Or listen to an audiobook or podcast. Spring cleaning can be a drag but it helps to be able to look forward to something once it’s completed. It’s easy to accomplish a task without giving yourself a well-deserved pat on the back so once you’ve finished, treat yourself to a small reward, whether it’s going out for lunch or dinner, indulging in your favorite dessert, watching a movie, or even taking a nap.